Guest blog – Dawn Eastmead starts to sew again! Dawn is a good friend of mine. She is a senior civil servant who has worked on housing, neighbourhood renewal, resilience, planning, fire safety and flood recovery. She is a gorgeous young grandma, and we meet up from time to time to enjoy a nice vegetarian meal at Grainstore in Kings Cross. We don’t see eye to eye on goats cheese (she loathes it) but otherwise we have a lot in common. She has been following this blog since it started and told me that this had encouraged her to take up sewing again. I first started knitting, not sewing, in my late teens. Luckily punk was in and so were holey jumpers! 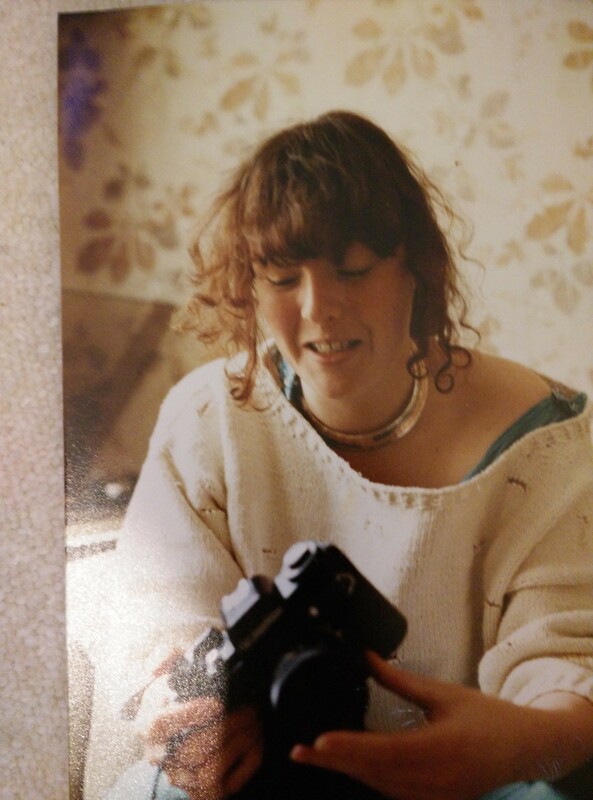 I was a riot of mohair and black string knits. Not all were punky though, and on occasion I made more classic and sedate patterns. This big 1980s jumper was made with cream cotton yarn, customised with little caterpillar holes made of string! The little holes were formed by just knitting in a short piece of string for a row or two. My Mum taught me to knit, an I took it up more seriously when she said didn’t want to always be knitting in black, so I had to knit my own. And my Mum taught me to read a pattern. It was like learning a new language. Having said that I don’t remember following patterns that closely, and certainly don’t remember buying many in shops. I guess I must have inherited them. Knitting did not seem to be that common amongst my friends, and I do remember a fair bit of “Make me one, please!” I thought I put down the needles after I had my first daughter (I did manage the traditional baby cardigans and bonnets) but an ex reminded me that I had in fact knitted him a jumper some years later. And it is a skill you don’t forget. I am the process of teaching my younger daughter how to knit – how about that? I loved knitting, navigating complex patterns, learning new stitches, but boy, was it slow. And restrictive – I didn’t really fancy the idea of a knitted dress or skirt. Another jumper anyone? So I bought a sewing machine, a lovely old Singer – the sort you now see decorating the windows of AllSaints branches up and down the county. Soooo much quicker. And so easy, all you needed to do (all I did) was cut round the clothes you already owned. I don’t have many pictures from those days, but here is a vintage velvet dress (no I didn’t make it!) that I got in Aflek’s Palace in Manchester. 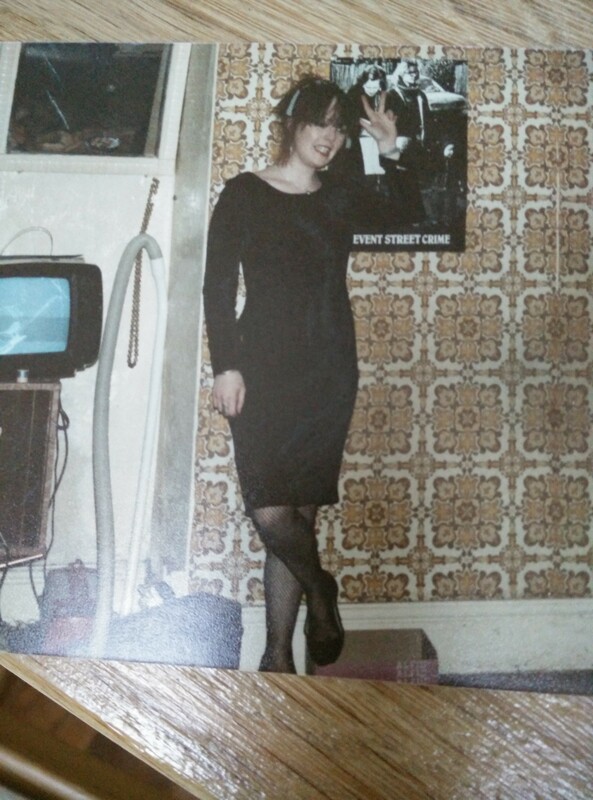 The picture is taken in typically slovenly student digs, and I was getting ready for working a shift in a rather seedy nightclub. It was a gorgeous dress and I always felt very glamorous in it. I used it as a template for countless slinky dresses with ill-fitting zips up the back. My technique was quite basic. I literally pinned the dress, arms outstretched, to material and cut around it for the front, doing something similar for the two back pieces, adding a centimetre or two for sewing. Sewing the pieces together was always a bit hit or miss, and I had to make a lot of adjustments as I went along. Not I know a bit more about sewing it’s a miracle that my approach produced something wearable! I never used darts and always had a bit of trouble with the necklines. Using the ‘cutting round things’ technique, I made trousers, tops, skirts (they were dreadful, I could not do waist bands), and even an unlined donkey jacket in two shades of blue corduroy – nothing fancy like leather, but I did have buttons, which was odd, because I don’t remember being able to do button holes! As I recall, the jacket was one of my more sophisticated projects, the jacket itself borrowed from one of the boys in the house, with the component parts (sleeves, collar, patch pockets), cut out in newspaper before I let myself loose on the material. It wasn’t very warm in coldest Manchester, but I did wear it over the rather better made jumpers! Below is one of the other few surviving pictures of the time. Here I am wearing an off the shoulder top and trousers. The top I definitely made, from some cotton picked up on the market, I don’t think I made the trousers, but did use them as a basis for similar trousers. 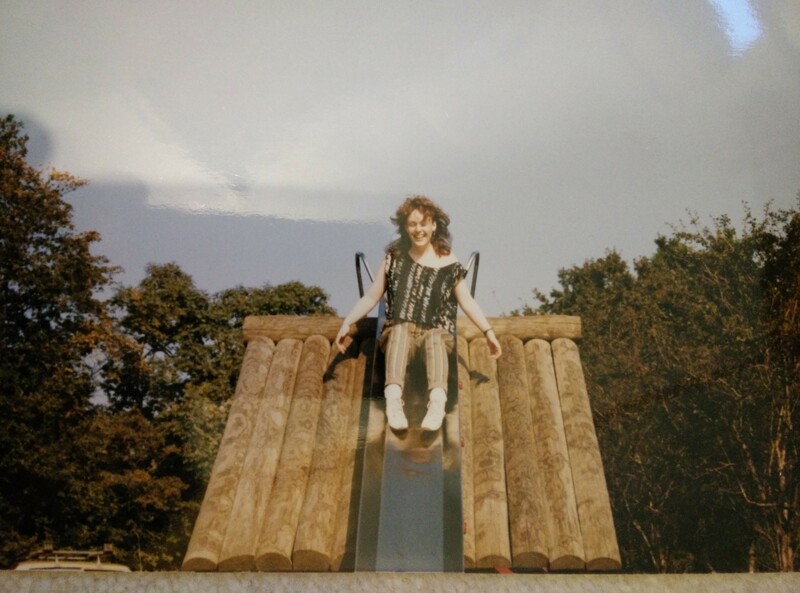 This picture was taken by my then boyfriend in the local park, somewhere in the mid 1980s. You can see I didn’t care too much then what I looked like! You’ll also see, that I still had problems getting the neck right. It was cheap, fast, and fun. When you are twenty it doesn’t matter that things don’t fit well and the stitching is a bit wonky – I was only ever wearing most of the stuff in the dark and didn’t expect it to last long anyway. Nowadays sewing is my hobby. I rediscovered it after a gap of more than twenty years (during which I mainly only sewed to take up trousers, sew on buttons and make the odd set of curtains). 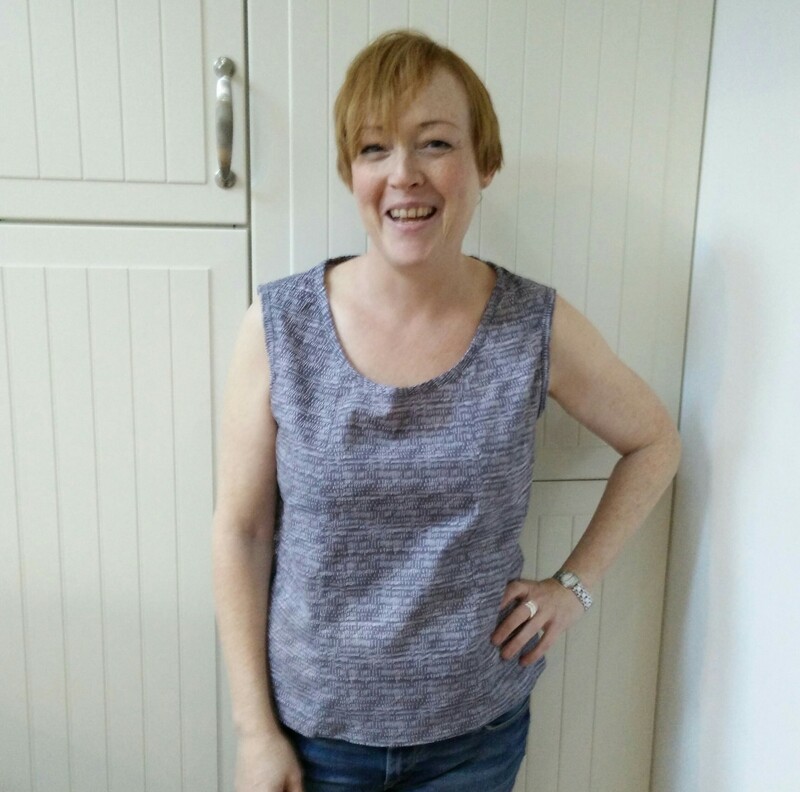 Inspired by Fit and Flare I decided to brush off my so called skills and had a few proper lessons locally with a lovely woman called Joy Moore, spending two happy weekends in her workshop learning to sew straight (the machine does it for you, who knew? ), appliqué, interlining, covering buttons, button holes, hemming, seams, waist bands, putting in a zip, and the importance of ironing. I also learned the basics of following patterns. 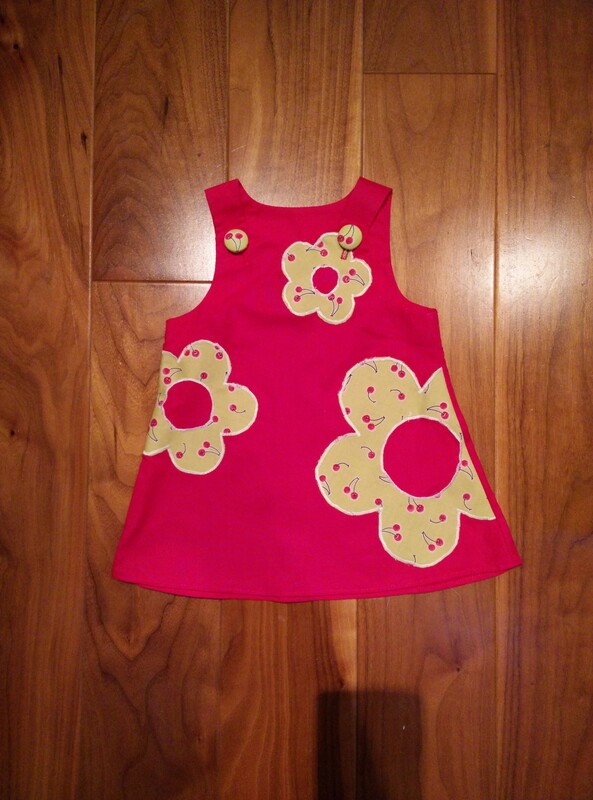 I made some cushions, place mats and this little baby’s dress. I second Joyce’s comment! Brava. I have followed a similar sewing trajectory to you and am having great fun learning to fit garments. Like your stripey top! Dawn – I have been meaning to respond to the gaping neckline problem all day. I was going to write a post on it, but found a very good explanation on the internet that says exactly what I was going to say. Try this – I am sure one or other solution will work for you. I use both approaches. Ooh…That’s a useful tutorial- thanks for sharing. Thanks for the encouragement! And thanks Kate for the tutorial link, I shall give that a go! I’ve had a thought all day, so I’m back to post it. Have you considered the draping method of sewing…it would seem to me that it would suit , at least your earlier style, of sewing. I have considered it myself but I prefer a more tailored style… just a thought……..keep up the good work, your little dress is adorable!